Corporate Social Responsibility (CSR) and Responsible Retailing have become growing topics of concern for SPAR Hungary, with the partner supporting people and charities in need, as well as promoting a healthy lifestyle through sports sponsorship. In 2018, almost €430,000 was spent on CSR activities. In the last three years, SPAR Hungary has been stepping up its sustainable operations and has invested more than €88 million in environmentally friendly solutions in stores around the country. Furthermore, SPAR is the first retailer in the country to trial reusable bags for fruit and vegetables. For more than 20 years, SPAR Hungary has supported the local charity organisation, the Hungarian Maltese Charity Service. Together they run the annual Joy to Give! Christmas donation campaign, which in 2018 resulted in the delivery of more than 30,000 food packages to people in need. To make sure the most beneficial products were donated, a shopping list of several thousand items was compiled. SPAR Hungary strongly believes in the integration and long-term employment of people with disabilities – seeking forms of support to ensure everyone experiences equal opportunities. For the past two years, the SPAR Partner has been cooperating with Janka Tanya, a non-profit organisation assisting young people living with autism. Janka Tanya runs full-day programmes that create a feeling of success and allow those with autism to participate in work and social life. Twice a week, staff of the INTERSPAR Hypermarket in Veszprém welcome young people from the Janka Tanya programme who, under the mentorship of SPAR team members, complete numerous tasks in the shop. 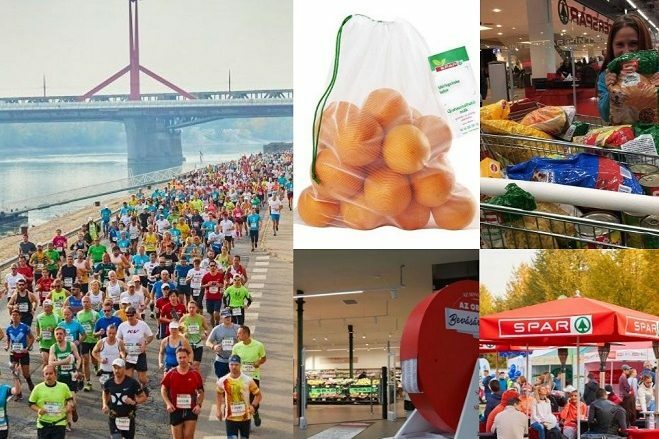 SPAR Hungary is the primary sponsor of Hungary’s largest social sports event, the SPAR Budapest Marathon® festival. The event promotes a healthy lifestyle with the participation of tens of thousands of people every year. It is not only an opportunity for sports enthusiasts to test their endurance, but also focuses on promoting a disciplined training regime and a health-conscious lifestyle. It’s not only the well-being of people that SPAR Hungary is concerned with, but of animals too. Through a unique donation programme launched eight years ago, the SPAR Partner provides support for the care and rescue efforts of Hungarian zoological parks, shelters and wildlife sanctuaries. Last year, over 300 SPAR stores provided 2,725 tonnes of animal food and care products to these organisations and every year, throughout the year, SPAR stores in Hungary donate dry and tinned animal food to the Animal Rescue Service (Országos Állatvédőrség). Over the last three years, SPAR Hungary has renovated 63 stores in Hungary with a total investment of more than €88 million. Energy-efficiency is a key aspect of each modernisation with energy-efficient equipment being integrated into modernised store units, further reducing the ecological footprint of SPAR stores. As of 2018, SPAR Hungary has adopted the use of environmentally-friendly transcritical CO2 refrigeration systems. In many cases, integrated cooling systems have been installed in SPAR stores, enabling the heat emitted by the cooling equipment to be used for heating the store itself. This is commonly considered to be one of the most efficient energy-saving solutions. Going forwards, a standard measure for new and renovated stores will be to install well-insulated, modern facades. In 20 SPAR stores in the cities of Szeged, Győr and Tatabánya, customers are being encouraged to make use of the new reusable fruit and vegetable bags that are available. This latest green initiative by SPAR Hungary is a first in the Hungarian retail sector. The easy-to-handle, multi-use bags can be used for years, resulting in less plastic waste. If the initiative proves successful, SPAR Hungary is expected to introduce the bags to every SPAR store in the country. “As a responsible retailer, our objective is to reduce our environmental footprint. We therefore put great emphasis on significantly reducing the volume of waste, supporting sorted waste collection and applying environmentally-friendly energy measures and technologies in each of our stores. In the spirit of environmental consciousness, we are now providing the customers of 20 of ours stores with multi-use bags to reduce plastic waste,” Márk Maczelka, Head of Communications SPAR Hungary.